Due to the nature of online design services, I usually don't receive any professionally photographed "after" shots of the rooms that I have had the pleasure to work on. Clients sometimes send me in-progress photos from what they've installed from the design plan, but other than that, there aren't any full-blown reveal photos that capture the before and after room transformations. In lieu of that, I thought I'd start sharing some projects I work on behind the scenes - with some insight on project scope, budget, and before room shots. 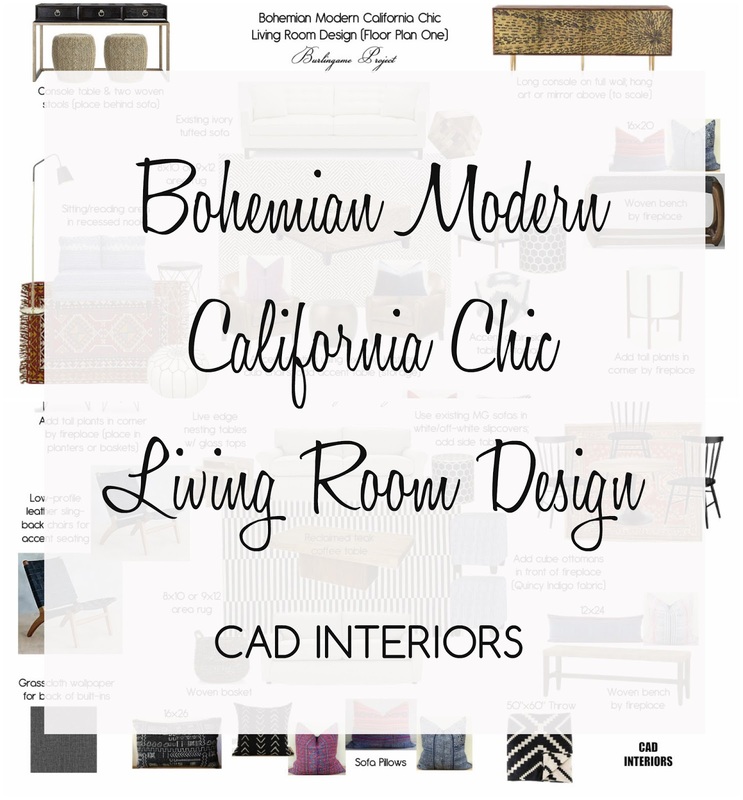 One of my favorite e-design projects to date is one that I ultimately penned "Bohemian Modern California Chic". It's one of my favorites because I am personally drawn to this design aesthetic and would implement it in my own home! Client: Family of five who recently located from the east coast to the west coast due to a job transfer. Project: The family completed a full interior and exterior renovation of their new west coast home, and requested design assistance for their spacious new living room. The room has direct sight lines to the dining room, kitchen, and entryway. New large area rug, additional seating, and decor (throw pillows) were on the priority list. Client also wanted new furniture, except sofa(s). Goal: Previous furnishings and decor were very "east coast" traditional and more formal in look and feel. Client wanted a more relaxed, family-friendly, semi-modern California vibe with bohemian touches (via accessories). What a gorgeous home, right?! These clients have great taste. You should see the exterior. For this particular project, I ended up providing the client with two separate living room designs and respective floor plans. She wanted to reuse one of her two existing sofa options in the space, so I actually designed the room using each option. I thoroughly enjoyed working with this client, and totally wished it was a local project. The couple has excellent and refined, yet somewhat traditional taste (particularly the husband). I loved the fact that they were willing to push their design comfort limits and try something different from what they were accustomed to! In the coming weeks, I will be accepting new projects again. So if you're interested in design services, without the full-blown cost and commitment of having an onsite interior designer, feel free to e-mail me at cdamasco20@yahoo.com for a quote.